Photoshoot on pajamas in morning. Multiracial couple on the bed. Man taking photos of woman on old moving-film camera. 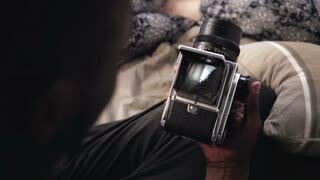 Young african man in pajamas sitting on the bed and holding old photocamera. Guy talking photo on moving-film camera. Close-up view of man opens a video recorder cover of old moving-fil camera. Photographer takes the photo of young woman. Multiethnic couple have a photoshoot. View of young woman in video recorder of old moving-film camera. Man take a photo. Young multiethnic couple on the bed. Man in pajamas taking photos of woman on old moving-film camera on the bed. Close-up view of photographer taking photo on old moving-film camera. Young woman in pajamas posing to man. Handsome african model man in pajamas posing to photographer. Woman taking photos on old moving-film camera. Photographer taking photo on old moving-film camera. Young woman in pajamas taking photos. View through the curtain. Young man taking photo of woman on old moving-film camera. Beautiful girl in pajamas posing, doing up hair. Young woman in pajamas posing to photographer. 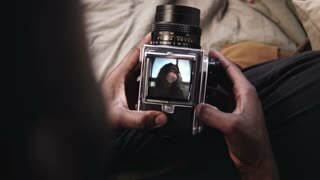 Handsome man takes photos on old moving-film camera in the bed.